I'm standing outside the Dallas Morning News building. Worked with more than a dozen journalists, individually or in pairs, to better use social media tools like Twitter, Facebook, etc. And today I filmed a video for a feature, reporting alongside a another Web intern working on the article. 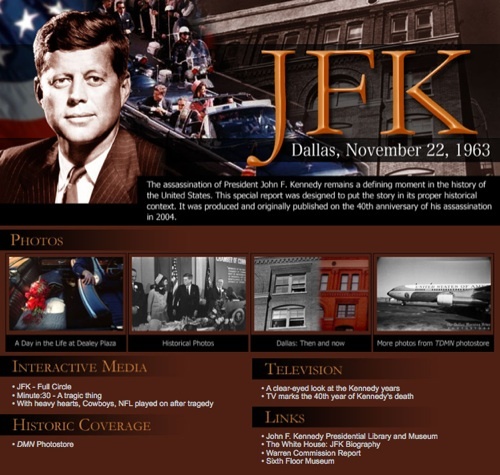 One of my backburner projects that’s now moving to the frontburner is re-imagining and rebuilding the DMN’s John F. Kennedy page. I’ve been brainstorming and researching since before I arrived and, now that things are kicking into gear, I’d like your help and feedback. What is the purpose of this page/section? What story are is it telling? What’s the best way to tell the story? What do you want to see when you first arrive? How do you want to navigate through this? With all of this, how can we engage people and foster quality conversations? How can we best integrate community content and comments? How can we best keep it dynamic and alive? The first multimedia committee meeting for the project is Thursday Wednesday (July 29). Know anyone who may have good insights? Pass it along! Many thanks in advance. My initial reaction to the JFK Project was that this could be the perfect opportunity to make an interactive timeline like no other. For example, at such and such time, the first shots were first; at this time, Officer Tippit was shot. You could even go on past Nov. 22, 1963 to the day of his funeral, the day the Warren Commission began, the day it was completed, the days that those present and important to that 11/22/63 died (i.e., Jackie Kennedy, Connelly, etc.) When you click on each bit of the timeline, it could take you to a sub-page, with links to articles done by the newspaper at the time with maybe a modern update on the top of the page. Definitely sounds like a cool project though. Best of luck with it! Great idea re-imagine the forum fantastic, i’ve gone past this location in d-town, explain to people what took place, the best way to tell the story would be to print it in the paper, asking questions, a survey. This is some-what a redo but you understand this is a historical individual during the Cuban Missile crisis they made books and stuff give this entire facelift of the website to a web-design firm. First thing I want to see when I arrive is the timeline, links, and menu, because it already happened this doesn’t involve anyone else but the city council. Definitely a time line would be awesome, something that’s interactive and is real user friendly. With the time line video would be a definite inclusion for each date with little interactive bit that user can access on each page, also little history facts at each point too. Also it would be great to also include other history facts from around the world at the time of each featured date event, it would be nice to see what was happening in the world also which would be a great add on. Also a video feature where users could post their thoughts regarding each event, so u could have a list of responses be date to get user views and feedback from around the world. Good luck!! this sounds like a real exciting project. I think the timeline idea would work best as well. In fact, the sample timeline already uses the JFK assassination as an example. @Emily and Sean: It’s like you guys are in my head. Those are literally my exact ideas (down to the SIMILE timeline with the JFK example). @Max: Incorporating video is definitely in the plan, but I don’t think it will be for every day or timeline item. The two most important factors would be: 1) If video is the best way to convey the story and 2) If video is available or could be produced. Including other historical facts is a good idea, but I think it would take second or third seat to the main story. 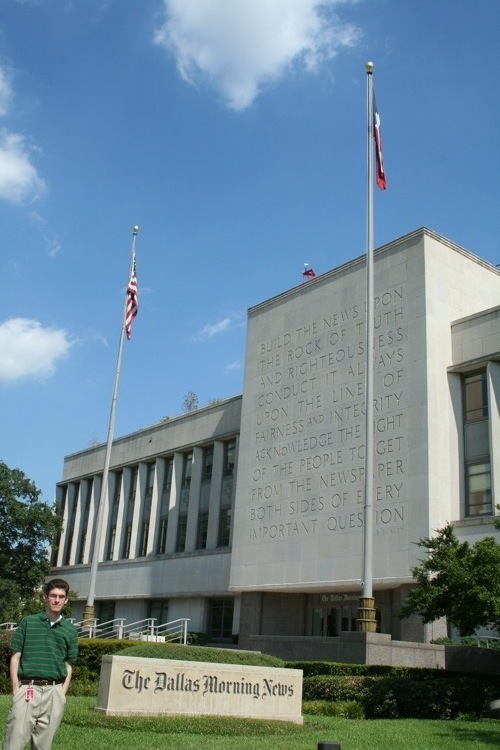 The idea is to offer something uniquely valuable and informative, highlighting the DMN’s exclusive/special content that can’t be found elsewhere.